Singapore is already the third most densely populated country in the world with 5.3 million people (of which 40% are foreigners). Overcrowding has contributed to a stressful society, has caused property prices to escalate and COE prices to skyrocket, and at least partly responsible for the MRT system’s frequent breakdowns. The situation has led to Singaporeans questioning the meaning of our citizenship. And yet the PAP wants to increase the population to 7 million. Foreign PMETs wishing to work in Singapore will be assessed via a point system. Only those with required qualifications, skills, and experience will be able to work here. Employers will be able to hire foreign professionals only if they have made every effort to employ a Singaporean first. Singaporeans are emigrating at an alarming rate. To stem this brain drain, we need to lower the cost of living (especially housing and health care) which is creating a highly stressful lifestyle for our people. Reducing the cost of living will encourage young couples to stay and have more children. The PAP increases population size to raise GDP figures. In truth, the GDP is not a good indicator of a country’s economic well-being. A better index is the Genuine Progress Indicator (GPI), which takes into account not only the GDP but also the costs incurred in building up the GDP (costs such as crime, pollution, family breakdown, psychological health, etc.). To strengthen our national identity, the Ethnic Integration Policy which determines the percentage of ethnic HDB dwellers in each estate should be abolished. The identification of “race” on our Identity Cards should also be removed. Ministerial salaries are based on GDP growth. Ministers’ salaries should be pegged to the GPI instead. In this way, the happier Singaporeans are and the higher our quality of life, the better our ministers are rewarded. The net effect of these proposals will considerably reduce the current number of foreign workers in Singapore while allowing entry only to real foreign talent that our economy needs. 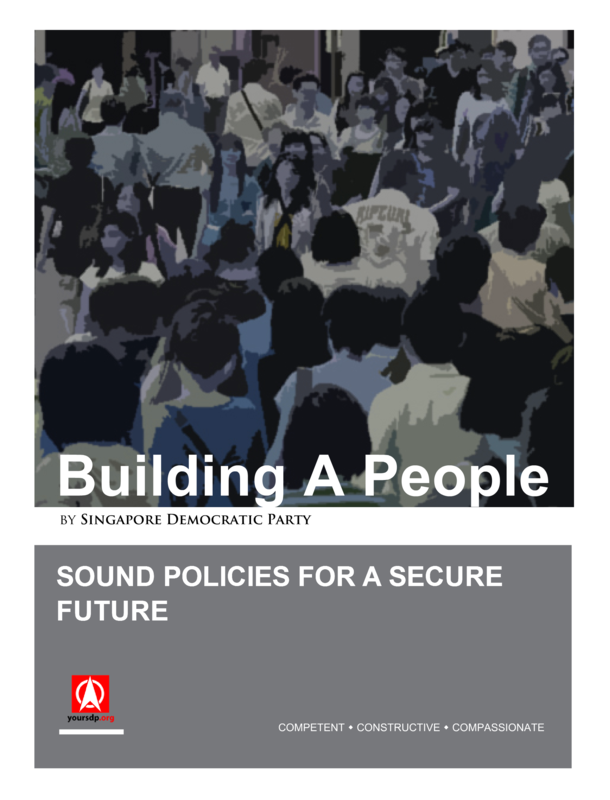 Read the full paper Building A People: Sound Policies For A Secure Future here. The SDP will be launching our Malay policy paper this Saturday. The single most important motivation for writing this paper is the concern that the Singaporean identity is being eroded with the influx of foreigners. Titled A Singapore for All Singaporeans: Addressing the Concerns of the Malay Community, the paper calls for the proper regard for, and of, our Malay community which forms an integral part of our national culture and identity. Neglecting the Malay-Muslim community will also mean destroying a part of who we are, and have come to be, as Singaporeans. It has grave implications for our future as a people. GDP - a cancer causing agent? In its relentless chase of GDP growth, China has seen unprecedented increases in the pollution of its air and waterways to the extent that "cancer villages" are sprouting up all over the country. Even the Chinese government has acknowledged that villages in some parts of the country worst hit by pollution and environmental degradation have seen a sharp rise in the number of cancer and cancer-related illnesses. Launch of SDP's "Building A People: Sound Policies For A Secure Future"
Dr Vincent Wijeysingha and Mr Jeremy Chen present SDP's population policy paper "Building A People: Sound Policies For A Secure Future"
Overpopulation can cause health problems through poor sanitation and pollution. If there is an epidemic, viruses spread faster in denser populations. In smaller human populations, viruses go extinct as there would be limited numbers of susceptible individuals. Even when Prime Minister Lee Hsien Loong recanted the 6.9 million target, he qualified that the figure was a "worst case scenario” and that the Government would review this number after 2020. In other words, the target is still very much in the PAP's sights.